Understandably, we see a number of canine patients who are anxious and fearful of their visits to Newtown Square Veterinary Hospital. Our staff fully embraces the Fear Free initiative, doing our best to ensure a calm, welcoming and nonthreatening environment for our patients. Dr. DiGiacomo advocates for the use of calming medications, both in the form of supplements and prescription medications, for cats and dogs that display anxiety or fear-related aggression when they visit us. Despite our best efforts, the Fear Free approach does not mean that every one of our canine patients will be calm and accepting of the medical procedures we might need to perform in an appointment. Even basic handling such as for nail trims or ear cleanings can cause a fearful dog to become reactive; reactive dogs may snap and bite our staff. For fearful and anxious patients, it is often in their best interest (and ours) to become acclimated to wearing a muzzle in situations that may trigger reactivity. The Muzzle Up Project is a movement to de-stigmatize the usage of muzzles in reactive dogs. 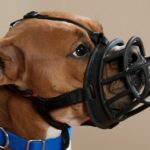 When a dog is trained to be comfortable with a muzzle at home, and desensitized to the feeling of wearing the muzzle, it can be life changing for owners and veterinary staff alike. Owners can be less nervous that their fearful dog may bite someone, and veterinary staff can safely handle the dog without fear of sustaining injury. 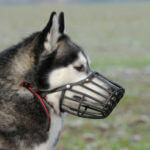 Dog muzzles are in widespread use in Europe and it has become a cultural norm there. When my husband and I took trains throughout Europe on vacation several years ago, we were surprised to see that dogs were allowed on public transportation such as subways; however, every one of these dogs was wearing a basket muzzle. 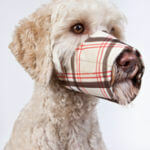 These dogs were calm and clearly comfortable with the muzzles, showing no signs of distress or discomfort.